You can change the name of any file or folder you create in Windows 10. (Don’t rename files in the Windows or Program Files folders.) 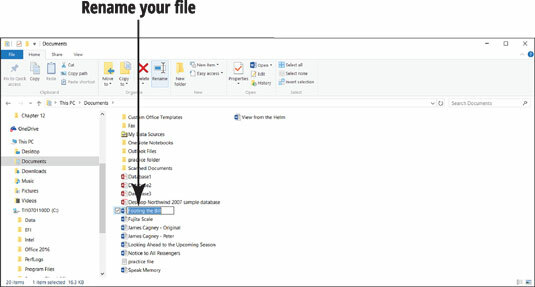 For this exercise, select the Documents folder in File Explorer. Then select one of your files. On the Home tab, select the Rename button. In the content area, the current name of the file or folder is selected, as shown. If you type anything while the text is selected, you erase the current name, which is convenient if the new name is completely different from the old name. If you want to keep most of the current name and edit it, select inside the name or press the left- or right-arrow key to move to the place in the name where you want to type new text. Type the new name, which can be more than 200 characters long (although a dozen characters may be more than enough). You can capitalize letters and use spaces and dashes, but you can’t use slashes or asterisks, which Windows 10 reserves for other purposes. When you’ve typed the new name, press the Enter key to finish the process.